Disney EMEA has greenlit IFTA award winning production company Brown Bag Films for an original new CG animation series, ‘The Happy Hugglemonsters’ for Disney Junior. The pre-school show, which will air in over 150 countries, was developed with the help of the Irish Film Board and is based on the books by Irish author Niamh Sharkey ‘I’m a Happy Hugglewug’. 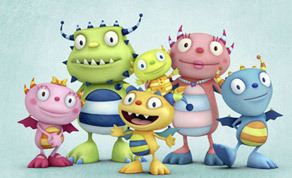 The show follows five-year-old Henry Hugglemonster, the middle child in a happy but wacky close-knit monster family The Hugglemonsters. The illustration style of the books will be retained with the series’ CG animation. Brown Bag Films is working with Disney at their production hub in London to deliver 52x11 minute shows. The series is directed by Emmy Award winning director Norton Virgien (Rugrats, Doc McStuffins), the lead writer is Sascha Paladino (Wonder Pets, Ni-Hao Kai-Lan) and the series is produced by Gillian Higgins (Doc McStuffins, The Octonauts). The series is set to premiere on Disney Junior in autumn 2012 and full production for it has begun.